Your goal is to own and train a high-scoring Shetland Sheepdog performance champion. You’ve just purchased or whelped your new latest hopeful. How can you give him or her a head start for the chosen field? Actually, the foundation of many, if not most, top performance dogs begins before they even leave the litter box. Sheltie breeders are among the most inventive when it comes to challenging these tiny minds and bodies. Of course, socialization to various environments, footing, noise, smells, and people is critical during weeks four through eight. Play is absolutely essential. Puppies should have lots of toys, learn to play with balls, carry small objects, respond and play with people of all ages and sizes, and learn to accept a treat. Even before they are leash trained, puppies can learn to come for treat, sit with a hand signal, and do a short retrieve with their favorite toy. 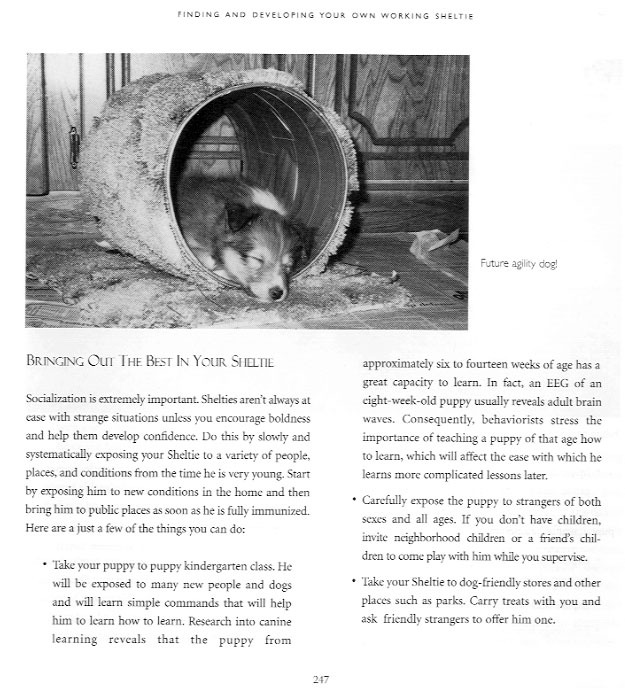 Karen TenEyck, a Sheltie breeder who was very successful in agility, was one of the first to add little obstacles such as a miniature obstacles to her whelping box; plastic stools, a ramp, PVC pipe for a tunnel, a dish drain tray for a slide or ramp. This type of training can continue after the puppy comes to her new home. Many people now purchase small children’s playground equipment for their puppy pens so that the pups learn to navigate many types of obstacles during their playtime. A miniature agility course can be set up and the pup enticed over the course with treats. The primary thing: always make it FUN. Don’t do too many repetitions. Never let the puppy become bored or tired out. Quit while she is still excited and eager. Change your routine often, and make sure any obstacles are the right size and not too difficult. At this young age all “training” should be playtime for puppy, with no correction and lots of praise and rewards. Socialization must continue, especially with Shelties. Take them everywhere: the mall, the park, a trail in the woods, to your friends’ homes, to the dog park (once they have had all their vaccinations). Let them walk on cement, blacktop, gym floors, carpeting, gravel, tarps, rubber mats, plastic ramps, playground equipment—everything you can find. Make sure that you take time to play tug, or catch, or retrieve in the presence of other people. Expose your puppy to other dogs and to people of all ages and sizes. Ask them to walk quietly up to your puppy and touch him gently under the chin or on the chest. Gradually she will be comfortable with having a stranger pet her on the body or head. Regardless of your eventual performance specialization, focus, attention, and fun need to be encouraged from day one. As soon as he is strong enough to pick up and carry a small Frisbee, that item can be introduced. As the puppy approaches three months, introduce her gradually to lambs or ducks and then adult sheep. Don’t force her to go near them. Allow that to happen in it’s own time. Let her watch as another dog works the sheep or ducks. Prevent the puppy from chasing livestock by distracting her with a toy or keeping her on a leash or behind a fence, but do not punish her or give harsh corrections if she tries to chase. You may turn off the herding instinct. Always think ahead to prevent situations that could get out of hand. If tracking is in your puppy’s future, start at eight weeks by hiding a delectable treat under one of three or four upturned paper cups. Reward her with the treat when she finds the right cup. Gradually progress to more difficult hiding places, such as in a wooden box, or in a section of PVC pipe. Soon you can begin to introduce various scents and ask the puppy to “Find.” Very young puppies can learn to follow a short trail and find a person. Again, you must make it a game, with lots of fun, encouragement and praise. Geier’s Razzle Dazzle Dancer, UD had a successful career in SAR. Razz was whelped in 1983 and won multiple High in Trials and placed in the Gaines Western Regional Open Obedience in 1985. In the fall of 1985, his owner Joyce Geier took him to his first SAR training session. Ten months later he was called out on his first search. Among his accomplishments were locating the body of a young man lost in the wilderness. He also located the scene of multiple homicides that had occurred six months earlier. He had a lot of focused drive and could do painstakingly accurate article and evidence work. This entry was posted in Performance and tagged performance training for puppies, play training puppies, puppy playground equipment, qualities of a performance dog, Shelties in performance events, Shetland Sheepdog performance records, shetland sheepdogs in agility, toys for puppies, training very young Sheltie puppies, working Shelties. Bookmark the permalink.